« Garlic Stuffed Pork Roast – Yummmm! 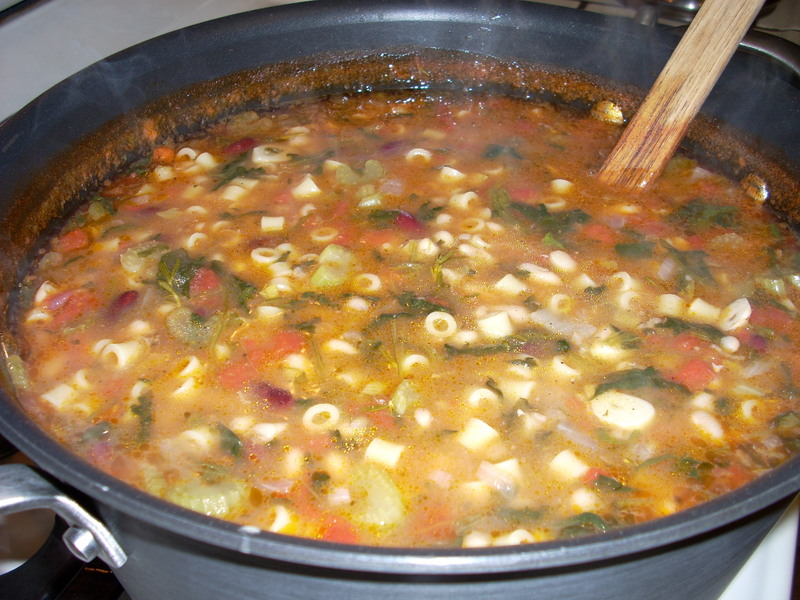 This pasta e fagioli (pasta and beans) recipe is a classic Italian recipe, fondly known as “pasta fazool”. I made it the other night since it was getting quite chilly here and it seemed right to do a nice warm meal. Rachel Ray calls dishes like this “stoup” – a thick soup or a thin stew! Heat the oil in a large pan or Dutch Oven. Add the onion, carrot, celery and garlic; saute until translucent. Add rosemary, thyme, salt and pepper. Simmer for 3 minutes. Add beans, tomatoes, chicken broth and wine. Bring to a boil. Boil 3 minutes; reduce heat to low and simmer for 5 minutes. Increase heat to medium. Add pasta and spinach. Cook for 10 minutes, until pasta is done al dente. Reduce heat to very low. You can leave soup simmering on low for quite awhile, or serve immediately. Serve in large bowls, topped with parmesan cheese and accompanied with crusty bread for sopping up the soup. It is very good warmed over the next day. Also easy to freeze.